The mechanical properties of a component are significantly influenced by the prevailing residual stress state. 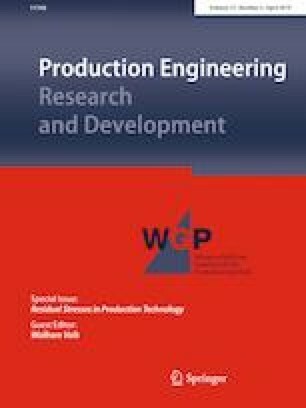 A deliberate induction of compressive residual stresses or a reduction of tensile residual stresses can improve the component properties, such as fatigue strength. Single point incremental forming is a flexible manufacturing process to produce complex shaped parts by the computerized numerically controlled movement of a hemispherical forming tool. Because the process parameters can be locally adjusted it is possible to influence the residual stress state of the component. The influence of the forming mechanisms bending, shearing and membrane stretching, as well as the role of the hydrostatic compression on the residual stress state is widely unknown. This work aims to fill this gap. Therefore, linear grooves are formed into AA5083 sheets in a single-stage incremental forming process. The residual stress state of the unclamped sheet is measured on both sides of the groove center by means of X-ray diffraction. The relative intensity of the dominant forming mechanism is adjusted by adapting the relevant process parameters step-down increment Δz and tool radius RTool. The forming mechanisms are analyzed numerically by splitting the total plastic energy into the three forming mechanisms bending, shearing and membrane stretching. The numerical results for bending and membrane stretching could be validated by crystallographic analysis. A shift in the energy ratio of the forming mechanism from bending to shearing with increasing relative step-down increment Δz/RTool could be observed numerically. The maximum residual stress amplitudes are found for Δz/RTool < 1. The results indicate that a deliberate residual stress state can be induced by adjusting the dominant forming mechanism of the process. Funded by the Deutsche Forschungsgemeinschaft (DFG, German Research Foundation)—TE 508/67-1; RE 688/76-1.